Enjoy several days of skiing! 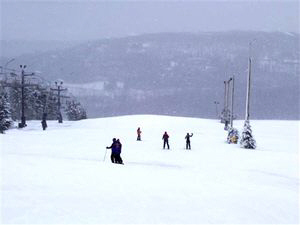 We organize and lead Weekend & Vacation Trips to Seven Springs, PA, Hidden Valley, PA, Timberline, WV, Killington, VT, Mount Snow, VT and other areas. The Hidden Valley & Seven Springs Trips are from the Washington, DC or Baltimore Metro areas. The Vermont Trips are from the Washington, DC, Baltimore, Philadelphia or New York City Metro areas and points in between. Please contact us for trips from other areas. Weekend & Vacation Trips include our helpful, caring and experienced professional adult staff (1:10 staff to student ratio), lift tickets, round-trip transportation via video equipped luxury motor coach (or video equipped van if it is a small trip), quality lodging, breakfast & dinner each day while at lodging, ski instructor trail guides for all levels with any needed and unlimited instruction by our PSIA (Professional Ski Instructors of America) certified staff. If you do not have your own equipment, you can either rent it at the ski area or you may rent it at your local ski shop before the trip. If you rent it at the ski area, our staff help the students through the rental shop to make sure they get the proper fit. Below are details for sample overnight Weekend Trips to Seven Springs, PA. We offer trips to several other ski areas. Contact us for details for any Ski & Snowboard Trips. For mid-week trips or trips to other Ski and Snowboard areas, please contact us . Save $$$ when paying in full 1 month in advance! * Rates quoted above are when paid at least 1 month in advance of trip. Additional $40 when when paid less than 1 month before trip.